The SEHSCDS web site uses GigPress to manage their events. 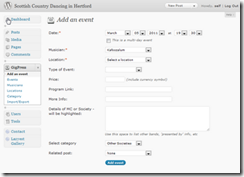 I’ve heavily modified the field names and a couple of the functions to suit the needs of the Dancing event diary. To this end the following only applies to the SEHSCDS version. You need to be already set up as an author for the SEHSCDS site and logged in Before you start to create an event you need to know what the event (gig) is and its details. OK now you know all of that, and are logged in click on dashboard link in the site manager box on the right hand side of the web site. 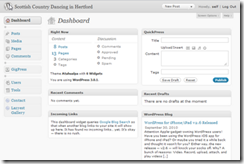 This will take you to the admin pages for WordPress. Once there click on the GigPress button and open up the gig press menu items. Before you start here, read step 7 – you might want to grab that link up front. To make life easier, the instructions work down the page but you might want to do 7 first in the real world. Now we can start to add the event details. start with the date and start time. Its unlikely that you have a multiday event so leave this button off. Now in the musician section click the pull down to see if the one you want is there, if it is select it, otherwise select add a new musician and add the Name in the box. Similarly for the location start by looking to see if its already there, if its not then add a new one. You will need the full address and postcode. If you have some link to help people find the place that’s great, add it into the map link for location field. This can either be a Google maps link that I describe here or a link you have copied from the home page of the venue. When selecting new names for locations its best to be short but precise so that other people will recognise it easily. If your not sure which one to pick, select the blank line at the top of the list and this will insert a blank type into the field. In the more info field add a telephone number or e-mail address for ticket information. This field is just text so anything you want really fits here. It is essential that the current categories are used and that new ones are not added as this would confuse the system. Ignore related post unless you have made a Blog entry about this already. Perhaps Beating retreat for example is in the blog already so you could link to that. Normally this just stays blank. This is very much like adding a new event, except that the data is already filled in for you. In the GigPress menu you can select Events, Musicians, Location and for each of these you will see a list of the existing entries. Musicians and Locations are fairly simple to follow. Simply click edit next to the one you want to edit and fill in the new details at the top of the page. For events its only slightly more complex. at the top of the list you can select to filter the list for a specific type of event, perhaps you only want to edit events with the silver cross band, so select that musician and press filter. This will give you a shorter list to review. Once you can find your event to edit, again simply click on edit and go ahead. When editing Events there is one extra box. This is called status. In this box you can select to say that the event has sold out or is cancelled. This is clearly only useful when the event really has sold out or is cancelled, but it will change the display on the Events page to include a clear warning. I expect that this will be only used very occasionally.